A family of three living in the Pittsburgh area. We both work full-time and work on raising our daughter. As of January 11, 2017, we are $302,001.87 in debt with a mortgage. We currently have $1,038,975.17 in assets. Our investment accounts are at $614,131.46. Our Net Worth is $736,973.30, up from $721,133.15 in December (2.2% increase). We’re slowing down on the debt paying, although we are increasing the “extra” principal that goes to our mortgage by a few hundred dollars per month. The rest of the money is going to investments, college, and our deck. I sort of did our taxes based on our final paychecks, and it’s looking like we might have a reduced Roth contribution this year, so I’m going to wait until we get our *real* W-2s and 1099-DIVs to make our contribution. The downside is that I tend to not get one of my 1099-DIV forms until the very last possible minute (mid-late Feb) On the plus side, it’s also looking like we’ll be getting about 2k back from the Feds. I had my withholding set to “married, but withhold at higher single rate” the entire year, and never bothered to reduce it to “married” mid-year, so a bit more than was needed was taken out. This entry was posted in Finances, Home and tagged debt on January 11, 2017 by Mom. We contributed $10,864.10 this month to our retirement accounts, and we gained $11,645.82 in investment value this month. $6500 of that is still in a savings account waiting to see if we can contribute it to a Roth or our taxable account (I’m picking up TurboTax on my way home from work today to get started). 2016 was a lot nicer to us in investment gains, but doesn’t quite make up for 2015’s losses, although we’re only about 10k lower than our planned account balance at the end of the year. We made our goals this year, thanks to a lot of cash back on our Fidelity card. We lost Dad’s awesome match and HSA contribution in May, and are down to a 4% match, and $500 HSA contribution (last year). This year, his company is contributing $1500 to our HSA, spaced out over 12 months. And our insurance is even better ($30/mth to cover all three of us with a HDHP! ), with a lower deductible. We’re planning on fully funding our Roths this year, or putting that money in our taxable account. I’m putting aside $917/mth in our budget for that, which will get me to 11k by next December. We’re also upping our base contribution to our taxable account to $300/mth (which will then be supplemented by our cash back), and we’re coming out about even given the loss of Dad’s matching from his old company. We’re still shooting for a contribution of 70k, and an increase of about 6% over the year, and if we continue to make it, we can retire in 2026. In 2016 we contributed $70,115.73 (100.17% of our goal of 70k), and we gained $47,608.99 in investment value (156.59% of our planned total). This entry was posted in Finances, Retirement on January 9, 2017 by Mom. Our RAV is paid off! And wonder of wonders, we got the title in less than 3 months – unlike when we moved here and it took 3 months for Toyota Financial to transfer our title to PA. I started tracking my debt and net worth just a month after the first payment for that car was due in July 2012 – how things have changed! November was quite a ride in the markets – up, up, up! We’re over $1 million dollars in assets (again), and approaching a $1 million net worth. Our net worth has increased 23.41% since January – a good bit of that is contributions, but not all of it. This entry was posted in Finances, Home and tagged debt on December 8, 2016 by Mom. I’ve been busy putting in the footers for my deck. This has been a long and arduous process, but finally complete! Now, to let it all cure, and then start on the wood part of the deck. I’m not looking forward to lifting a 2x12x18ft long piece of wood over my head (no matter how many people are helping!). These holes were probably the most annoying ever – there’s 2ft of gravel around the house covering the french drain. As we were digging, the gravel surrounding the hole kept falling into the hole. We ended up practically excavating the entire gravel area to get the footings deep enough. There’s a reason we used the tubes – to keep the gravel out of the holes. The work area ready to pour concrete. 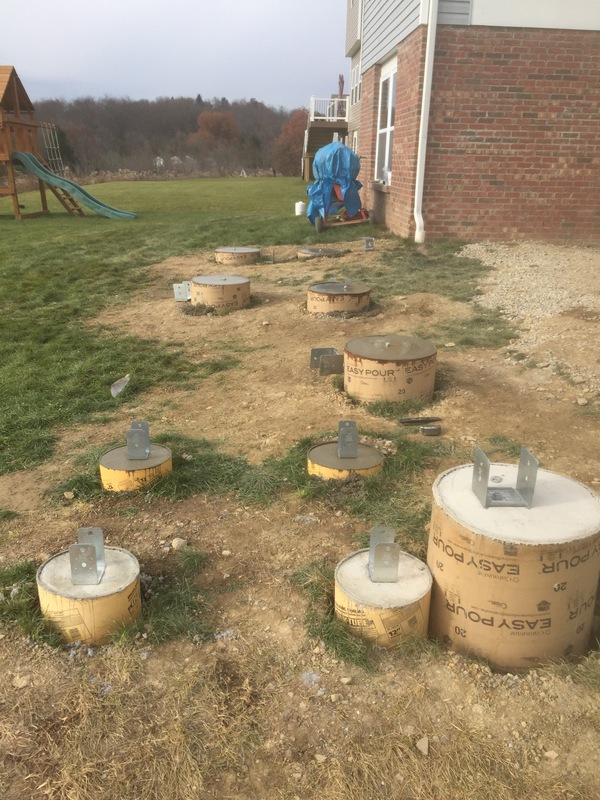 We had a mixer that holds 4 60lb bags of concrete, and each hole took between 16 and 20 bags. Luckily, the majority of the holes were big enough to just turn the mixer into the hole. 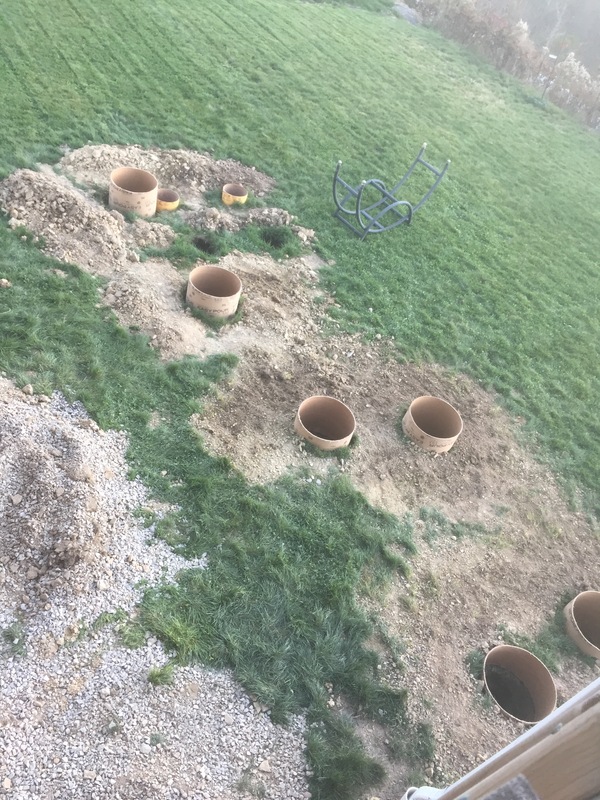 I had to use the wheelbarrow and shovel to fill the 12″ diameter holes. All done – the lighter concrete was done on day 1, the darker was just done that day (day 2). The j-bolts and support bases are installed according to the plans (ie, perfectly in line with each other and spaced appropriately). Although, we did discover that our house is not square – it’s off by about 3 degrees, we’ll have to correct for that when we put up the joists and decking. The cardboard tubing is going to be left in place to just decompose on it’s own, but we could use a hacksaw or circular saw to cut them off at ground level and remove them. Eventually, we’re going to put something under the deck as a patio, but we haven’t decided what yet, and there’s no rush. This entry was posted in Home on December 6, 2016 by Mom. We contributed $4,968.94 this month to our retirement accounts, and we gained $11,616.97 in investment value this month. I’ve been remiss in posting, but between Girl Scouts and working on our deck, I haven’t had much time in the evenings to make posts. We have our concrete poured and almost ready to accept posts. We need to wait at least 2 weeks, preferably 3 before putting the weight of the wood on the concrete, so we’re taking a short break over the holidays. Girl Scouts have started the “behind the scenes” stuff that happens for cookie sales, so that’s been taking a lot of my time. Even though the girls can’t sell until January 6! We’re on track for putting our 70k in “retirement” accounts this year, and setting up to do so next year as well. Dad’s company has (finally) announced their health plans for next year, and for $60/mth we get a family HDHP with a $1500 individual/$3000 family deductible plus $1500 into our HSA. I was wavering on whether to go with he HSA again in 2017, but with the changes, we’re *definitely* doing it. It’s nice working for a (primarily) European company! This entry was posted in Finances, Retirement on December 5, 2016 by Mom. We contributed $4,964.78 this month to our retirement accounts, and we lost $12,774.09 in investment value this month. October was not a good time to be in the markets – but a great time to add money! We added a lot this month, and we’re at a relatively stable situation. The only variance in our contributions now is how much cash back we get on our Fidelity card as that goes straight into our taxable investment account. And I plan on getting quite a bit in the next month or so as I pay for wood and materials with my cash back credit card. We’re on track to contribute our 70k this year. We have $6500 sitting in a savings account waiting on whether we put it into our Roths (the desired place) or our taxable account if we can’t contribute to our Roths. This year had a few too many changes in income and deductions that I’m not positive what our AGI will be (my back of the envelope calculation says we’ll be able to contribute to our Roths). In 2016 we contributed $54,282.69 (77.55% of our goal of 70k), and gained $24,346.24 in investment value. This entry was posted in Finances, Retirement on November 4, 2016 by Mom. It’s now almost mid-October, so I’m just going to combine September and October’s numbers. Nothing interesting has happened on paying down debt – most of our money has gone to the deck and retirement accounts. We’re on track to pay off our RAV in December, then we may or may not pay down the Camry faster – probably not. I’m likely to build up a good sized emergency fund (6 months) next. We only have about two months available right now, so I’d like to build that up. We can survive on one salary, and we have access to our taxable and a good bit of our Roth funds, so I’m not concerned, but I’d like a little more cushion. Once you’re done paying down debt, there’s a lot more choices of what to do with your money, so I’m having a hard time deciding what exactly to do with it! This entry was posted in Finances, Home and tagged debt on October 12, 2016 by Mom. We contributed $4,958.33 this month to our retirement accounts, and we gained $1240.00 in investment value this month. September was a very busy month for us. We tried to start the deck (and failed miserably), I got a killer sinus infection that had me down for two weeks, and Girl Scouts started. The markets were relatively flat, and most of our increase was from contributions. We have 4k set aside for possibly a Roth contribution (depending on if we can contribute), and that money is not being “counted” as it’s not in a specific account yet, just hanging out in our checking/savings until I decide if it’s going to the Roth or to the taxable account. Ideally, I put 5.5k of it in Dad’s Roth so that we can get out of ETFs and into a mutual fund in his account. The rest (planned 1.5k) will top off my Roth, which already has over 10k in it. Other than saving money, I haven’t really done any progress on the deck. We tried to drill holes, but the auger we rented wasn’t powerful enough and we were told (after the fact) that homeowners can’t rent the equipment we’d need – so I called a few places for quotes, but it’s such a small job, a lot of companies just don’t want to take it on. Now that I’m not sick or catching up from being sick, I need to make more phone calls to find someone to dig said holes. In 2016 we contributed $49,317.91 (70.45% of our goal of 70k), and gained $37,120.33 in investment value. This entry was posted in Finances, Retirement on October 10, 2016 by Mom. We contributed $4,965.54 this month to our retirement accounts, and we gained all of $373.99 in investment value this month. Can you believe it’s September already! We’re well on-track to hopefully invest our full 70k this year. I have 3k sitting in a checking account waiting to see if it’s going to go into a Roth or into our taxable account, and I’m not counting that in our values until it ends up in whichever account is appropriate. I also have about $1500 in Dad’s “new” HSA sitting just earning interest because the investment options are so bad (an S&P 500 index for .45%). I’m going to do a rollover at the end of the year to our “old” HSA, which offers Vanguard funds for .05% fees. It’s still up in the air whether we’re going to continue with the HSA account or move back to a more traditional PPO next year (the PPO is not significantly more expensive than the HDHP option at least this year, but I need to investigate more). 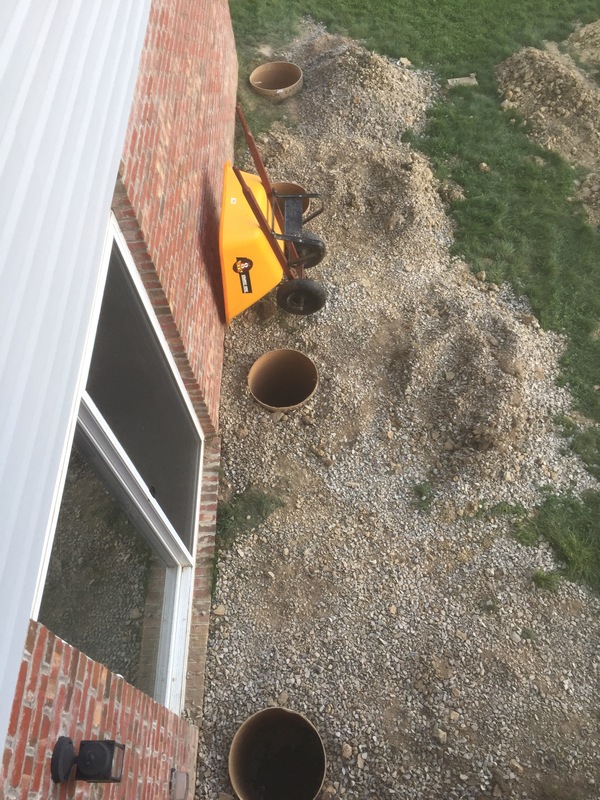 I have a permit for our deck, and we’re breaking ground on Saturday – we’re renting a two-person auger to “dig” the 14 holes necessary (10 big ones – 2″ diameter, 36″ deep – for the deck, 4 12″ diameter, 36″ deep ones for the landing). I’m putting together the final “bill of materials” for the wood and going to call around for the best price (including delivery). 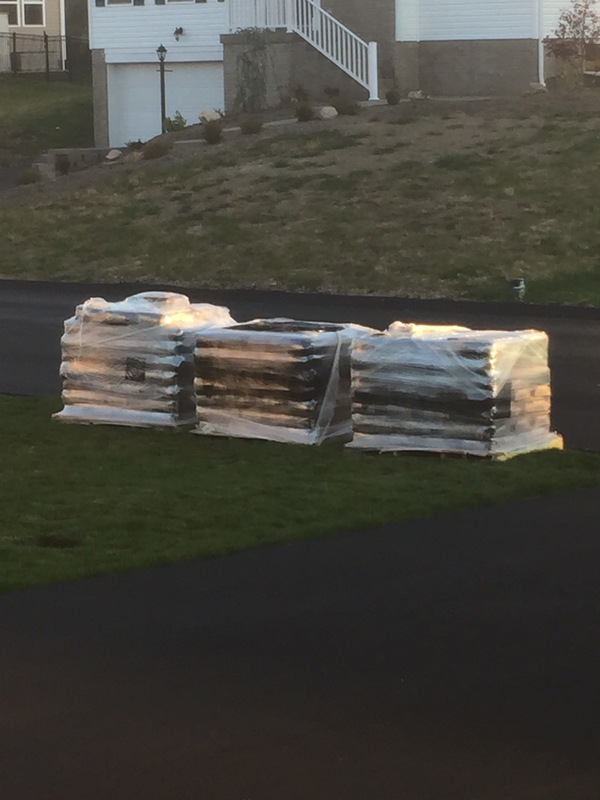 I also have to get 8000 lbs of concrete delivered to fill those holes with (once they’re inspected) – this is really happening, and the expensive parts are starting. In 2016 we contributed $44,359.58 (63.37% of our goal of 70k), and gained $35,880.33 in investment value. This entry was posted in Finances, Retirement on September 7, 2016 by Mom. Our deck plans are done, and I need to get them to the permit office this week. The expected cost is just over $13k, and I included a 30% “oops” factor into my calculations. 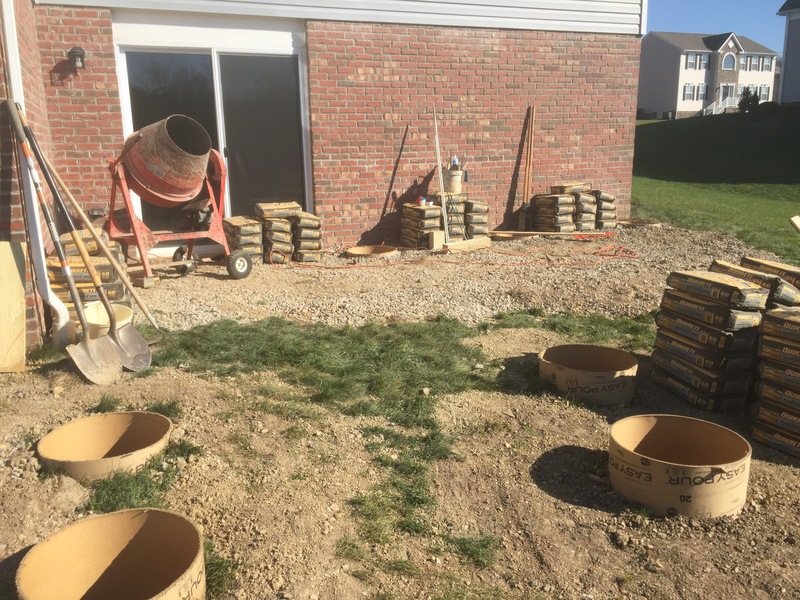 We’re planning on getting the concrete footings complete along with the poured patio (have to be done at separate times because of frost heave) in September, and the deck part done in October. We may or may not get the covered roof part done this winter, that will depend on weather, but we’ll have the patio and deck done to enjoy this fall and next spring! These updates may get boring shortly, if they’re not already. We’ve finished aggressively paying down the debt we were going to, are contributing quite a lot to our retirement accounts, and have generally entered a boring financial period of our lives. I’ll still be excited when we hit (self-defined) milestones like 1 million in assets (again), 1 million in net worth, cars paid off, mortgage paid off, etc, but it’s not quite the same as the laser focus on paying off debt. This entry was posted in Finances, Home and tagged debt on August 12, 2016 by Mom.